Dibrugarh University Recruitment 2018 , July – Assistant Professor : Hello Assam Career 2018 Job aspirants. Hope everything is good. Today we will going to inform you latest Dibrugarh University 2018 July notification. According to the latest Dibrugarh University Recruitment 2018, Applications ( 07 photocopies of the same) in the prescribed form of the Dibrugarh University are invited from the intending eligible candidates for the following tenural posts (as per UGC norms) so as to reach the Registrar on or before 25/07/2018 alongwith a Bank Draft of Rs. 500/- in favour of the Registrar, Dibrugarh University, Dibrugarh payable at Punjab National Bank, Dibrugarh University Branch (Code: 994000). 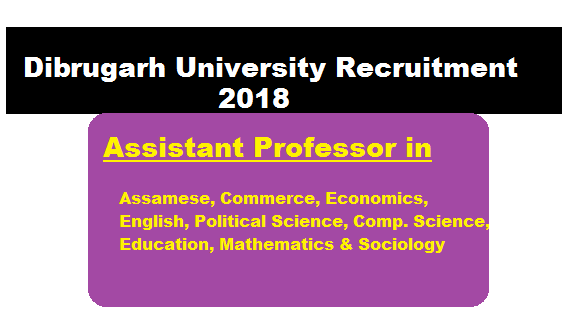 In this section, we will be mentioning details about the Recruitment of Assistant Professor Under Dibrugarh University Recruitment 2018 with all the important requirement criteria to apply for the posts. The prescribed application form for the above posts can be downloaded from the university’s website www.dibru.ac.in . Applications ( 07 photocopies of the same) in the prescribed form of the Dibrugarh University are invited from the intending eligible candidates for the following tenural posts (as per UGC norms) so as to reach the Registrar on or before 25/07/2018 alongwith a Bank Draft of Rs. 500/- in favour of the Registrar, Dibrugarh University, Dibrugarh payable at Punjab National Bank, Dibrugarh University Branch (Code: 994000).